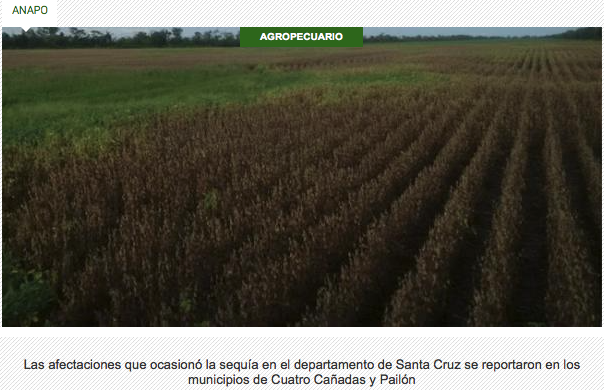 ANAPO reported that of the 600,000 hectares of soybeans, 20% have been lost; there are 40% with affectations and another 40% are in good condition. Demetrio Perez, president of the Association of Producers of Oilseeds and Wheat (ANAPO), confirmed the loss of 120,000 hectares of soybeans as a result of the drought. The producer said that the damages were reported in the municipalities of Cuatro Cañadas and Pailón. “It has been established that of the 600,000 hectares in the eastern department of Santa Cruz, 20% are considered as lost surface, 40% are classified as affected surface and the remaining 40% as a surface in good condition” Perez said through a statement. He added that there are concerns with the affected surface, representing some 250,000 hectares, which already have a decreased yield potential and the urgent need of rainfall to these areas, in order not to increase the rate of loss that already exists. Perez guaranteed the supply of the domestic market despite the damages, since for the 2014-2015 summer campaign has estimated a production of 800,000 tons of soybeans and local market demand only 30% of the total. He also said that due to these adverse climatic conditions of extreme drought, it is necessary that producers can count on modern technological tools, such as GM, which may allow to have genetically improved seed, tolerant to drought and can reduce risks of large losses as at present.